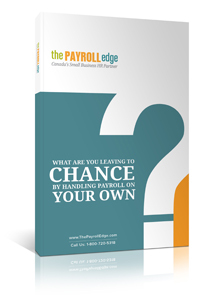 What Are You Leaving to Chance By Handling Payroll On Your Own? It’s natural for small-to-midsize business owners to never think to ask “Why wouldn’t I handle payroll on my own?” Most small business accounting software packages include the capability of processing payroll. This makes it easy for small-to-midsize business owners, especially when they are starting out, to ensure their staff receive a paycheque every payday. They just pop their hours into a few blank fields, press “print”, and voila! It’s so simple, even the boss can do it – and often actually does. How The Payroll Edge, unlike conventional outsourced payroll processors, mitigates these risks. Download our guide to learn how to protect your company from the risks involved with doing your own payroll.